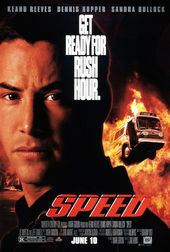 The opening sequence of Jan de Bont’s 1994 summer blockbuster Speed is deceptively simple: a long, slow drop down an elevator shaft with straightforward situational typography. What isn’t immediately apparent is that this shot was created using an 80-foot model of a 50-storey elevator shaft. As the camera traverses the shaft, the floor numbers can be seen toward the right of the frame, painted on the steel girders. The music, composed by Mark Mancina, begins eerie and quiet – strings on the edge. Small mechanical noises and echoes trickle in until the title typography, its underbelly cast in orange, zooms in around the 32nd storey, the music hitting its climax. A driving drum beat and the score proper come in thereafter, relentlessly moving the action downward. The opening of Speed functions in much the same way as that of The Terminator (1984) – all blue typography and strong, ominous music, unfurling the weight of the story like an overture. When the director’s credit finally appears on P3, the basement, we know we have reached the bottom. The position of the typography – within a large structure, alternately obstructed and revealed – is echoed almost a decade later in Richard Morrison’s opening to The Dreamers.